Boost your driving confidence with enhanced grip, for reduced braking distances even in the wettest conditions. The Goodyear EfficientGrip Performance tyre delivers excellent grip, shorter braking distances on wet roads and improved fuel efficiency. The WearControl Technology with two different tread compounds offers an optimal balance of low rolling resistance and high grip at wet. The 3D-Block-Active Braking-Technology enables short braking distance on dry roads. 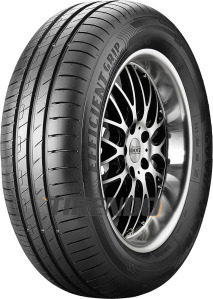 The all performance tyre for medium class and high end cars. The new EfficientGrip Performance features continuous circumferential ribs as well as Goodyear’s ActiveBraking Technology to improve handling and braking distances on both wet and dry roads. A new chafer compound reduces rolling resistance whilst a new base compound with innovative CoolCushion Layer2 increases energy efficiency and reduces fuel consumption as a result. Lower fuel consumption. 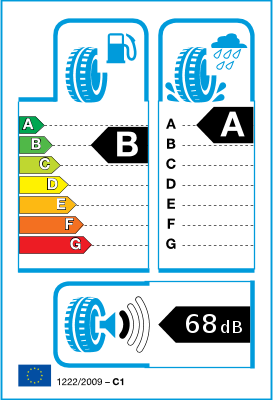 We use FuelSaving Technology to create a new base compound that reduces the tyre's energy dissipation. Rolling resistance is reduced by 18%4 meaning improved fuel efficiency and lower driving costs for you. A-rated wet grip. Rated A1 for wet grip performance, the highest rating awarded under EU regulations. Improved wet braking and lower rolling resistance. WearControl Technology ensures an optimal balance between wet grip and low rolling resistance for the life of the tyre. Shorter braking distances for driving confidence. ActiveBraking Technology increases contact between the tyre and the road surface for shorter braking distances – up to two metres (8%) shorter on wet roads2 and 3% shorter in the dry3. The EfficientGrip Performance tyre demonstrates such outstanding grip on wet surfaces that the majority of sizes available have received an A rating under EU regulations – the highest rating possible. The best wet braking with minimal resistance Goodyear's WearControl Technology is designed to strike the ideal balance between a firm grip on wet roads, and low rolling resistance, to reduce your petrol consumption and ensure a smoother ride. Reduced braking distance Enjoy the ultimate driving confidence on every journey with ActiveBraking Technology. This feature creates a larger contact surface between the tyre and road, to deliver dramatically shorter braking distances – as much as 8% less on wet roads, and up to 3% less on dry. Save on fuel Each tyre is made with a specially designed base compound that manages energy dissipation across the tyre. This FuelSaving Technology reduces rolling resistance by as much as 8%, which boosts fuel efficiency and decreases your costs over the long term.